"We are kindred spirits Your book is what my soul has been longing for... peace I love your writing. 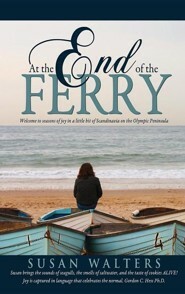 Reading "At the End of the Ferry" was a delightful glimpse into a world most of us only dream of. My mind truly escaped from the busyness and stress of this life. While I read Suzy's words, I got completely lost...lost in the sound of the waves crashing on the seawall and the smell of homemade soup. It made me want to book a one-way ticket to the peninsula and experience the wonder for myself. 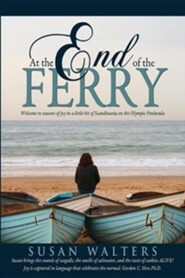 But instead I'll just reread "At the End of the Ferry" and get lost again. And again. And again. Katie Baker Meteorologist /Reporter CBS 5 News Phoenix, Arizona mother of 3 young children Susan Walters's adventurous "road less traveled" has not been extreme, but it has been unique. During her childhood, she discovered faith and nature in the wilderness that served as her backyard. Just over the fence, Susan learned to machete her way thru the bushes and wild to find what so few today take time to explore-a yard with few limits and without peers. From that simple beginning, her love for nature and all its trimmings was born. Later she progressed to a greater field of nature as she and her husband spent nearly a decade living and exploring the great outdoors of the High Sierras. As work opportunities increased the couple chose to follow a dream rather than a career path. That dream led them to a northwest lifestyle that typically only existed in the pages of history books; a love of the land, a gutsy pioneer spirit, a new found connection between the Creator and His creation. 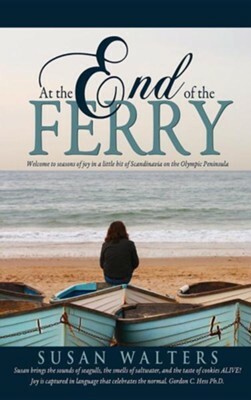 This world was found at The End of the Ferry, a tale of one woman's life for one year. I'm the author/artist and I want to review At the End of the Ferry.